Kidderminster Harriers finally signed the former Aston Villa striker Stefan Moore today initially as cover for the injured Justin Richards with a view to the month long contract being extended. Moore has been at Aggborough for the past two weeks mainly for his fitness and to see how he progressed with a few reserve games under his belt. So far he has played in the 5-2 victory at Bewdley Town and scored twice. Now his chance has come following the injury to Justin Richards at Northwich on Tuesday evening when he was forced to retire from the game with a hamstring injury. This signing has now confirmed that Richards will be out of the side for a while and also the proof that we were short of players in the strikers department anyway. 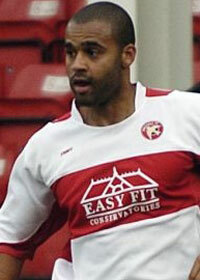 Stefan, who is the older brother of West Broms Luke Moore, started at the Villa as a trainee in August 2000 and eventually made thirty appearances for them and scored twice. He then went out on loan to a variety of clubs including Millwall and Leicester City until he was released in June 2000 and joined QPR where he made forty two appearances scoring three times. He was then released from Loftus Road and came back to Birmingham to join Walsall in February of this year but failed to hold down a place before being released at the end of the season. Now he's looking for another club could we be the one.